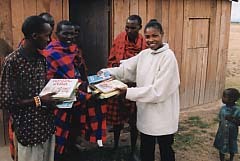 On the way to the Maasai Mara, about 30km off the road is the remote Maasai community of Olanganaiyo. We have formed a relationship with these people where we are hosted in their village and shown their way of life. Activities here are governed by your preferences and what may be going on in the village at the time. In the past our clients have attended a wedding and a naming ceremony, sat in on school lessons, milked the cows, drunk honey-beer in the bomas, slept in the mud-hut (for the hardy! 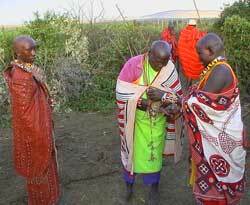 ), practised with bow and arrows, tried jewellery making and been on natural history walks with the Maasai guides. We employ local guides, local guards for the camp at night (keeping the lions away) and the women welcome people to their houses. In return we pay a fee per person ($5) into a community managed fund, plus wages to the people directly involved and regular supplies of equipment to the local school.